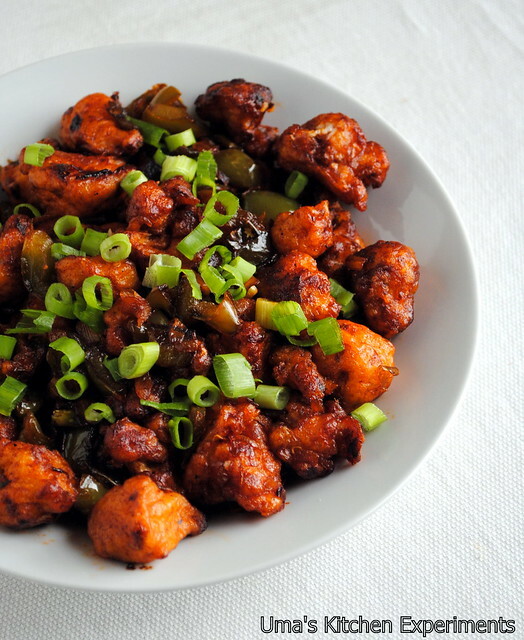 Gobi means Cauliflower in Hindi and Manchurian means a mixture of sweet and sour taste. This dish is a fusion of Indian and Chinese cuisines. Though you might find the preparation steps lengthy, the final outcome is delicious and it serves as a good appetizer. 1) Cut the cauliflower into small uniform size florets. 2) Add these florets to boiling water. Add a pinch of salt to the water and close the container with a lid and leave it for 5 minutes. 3) Drain the water and keep it aside. 4) In a mixing bowl, add maida / besan, cornflour, ginger paste, garlic paste, red chili powder and salt. Add a little bit water and prepare a batter. 5) Batter should be appropriately diluted. It should not be too watery nor it should be too thick. 6) Take a frying pan and heat the oil in it. 7) Dip the cauliflower florets in the prepared batter and fry them. 8) Fry florets well till they turn golden brown and crispy to taste. 1) Take a wide pan and heat the oil in it. 2) Add onions and saute them well. 3) Add ginger garlic paste and fry for few seconds. 4) Add green chillies, spring onions and capsicum. Saute them well for 3 minutes. 5) Add red chili powder and salt. Fry them well for another 5-10 minutes. 6) When all ingredients in the mixture appear cooked, add soy sauce, red chili sauce and tomato sauce. 7) If required add little water and mix the contents well. 8) Now the Manchurian is ready. 9) Add the fried crispy florets to this mixture and mix it gently. 10) Make sure Manchurian sauce blends well with the fried florets. 11) Reduce the flame and leave it for few minutes. Garnish with coriander leaves. You can also add spring onions for garnishing. 12) Transfer the contents from the stove to a bowl and after 10 minutes your tasty Gobi Manchurian is ready to be served.